Household Uses: Placing boric acid on carpets can help rid them of fleas. 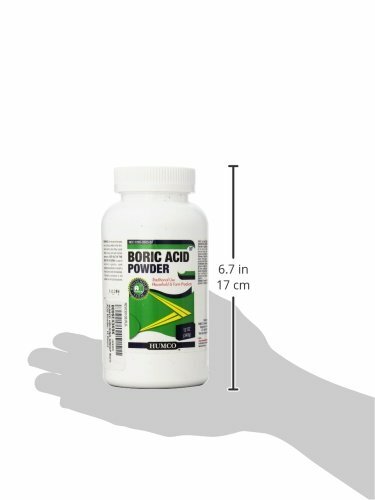 Boric acid can also inhibit the growth of fungus, making it a great wood preservative and termite defender in household furniture. Adding boric acid to your laundry load can help to remove stains and odor from clothing. Boric acid is also effective as an insecticide and pesticide. Health benefits: Boric acid has anti-arthritic properties that helps it promote bone and joint health. It also works as a natural and effective treatment for vaginal yeast infections and athlete’s foot. When heavily diluted with water, boric acid can be used to create and easy and effective eye wash for minor irritation or contagious eye infections. Cosmetic Uses: Boric acid is a commonly found ingredient in topical products that treat acne and other skin issues, as it can help kill breakout-causing bacteria. Details: Boric acid is used in many fields and in various forms. It is widely used in the medical field as an antiseptic, but it is most commonly used and an insecticide, preservative, lubricant, in nuclear power plants, and in many manufacturing industries. Home uses of boric acid include as an antiseptic, insecticide, and as a cleaning agent.